Heavenly cheesecake! We're talking a crunchy buttery biscuit base, topped with a lusciously creamy and tangy mixture of vanilla-scented cream cheese and Greek yogurt, and a scattering of fresh fruit. 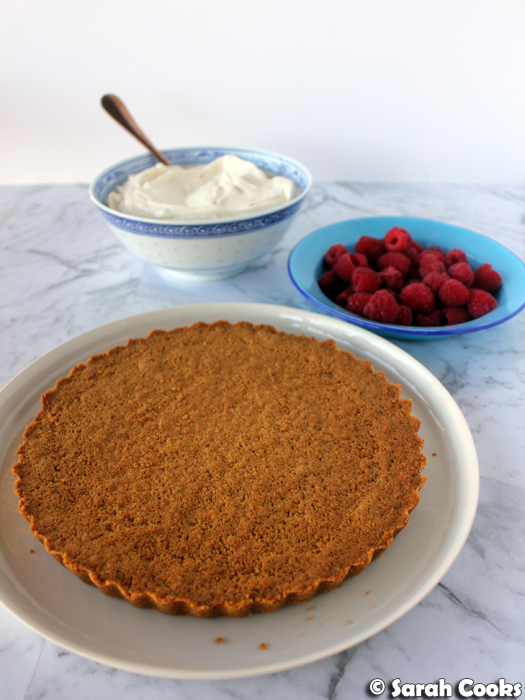 It's super easy and looks and tastes heavenly! This heavenly cheesecake was my dessert of choice at a dinner party we held on Easter Saturday. I wanted something delicious and decadent, but still quick to make, as I had a few other dishes to make and didn't want to spend all day in the kitchen. All boxes ticked! My huge stash of graham crackers in the pantry was further incentive. You may remember I made this cheesecake nine years ago for a mid-week dinner party. It was a winner then, and it's still a winner now. It was high time that I wrote up the recipe! It's essentially a riff on Joanna Weinberg's deconstructed cheesecake, from her lovely book How to Feed your Friends with Relish, with a few tweaks from me for added deliciousness. The base is simply a mixture of biscuit crumbs, melted butter and cinnamon. (I used pre-crumbed graham crackers, but crush your own Digestives or other plain biscuits if you can't find graham crackers). 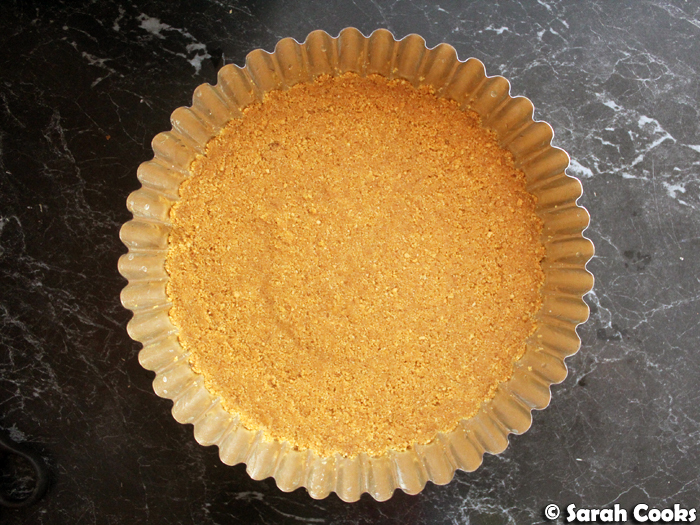 Press the mixture into the base of a 22cm tart tin and then bake for 10 minutes. Easy. 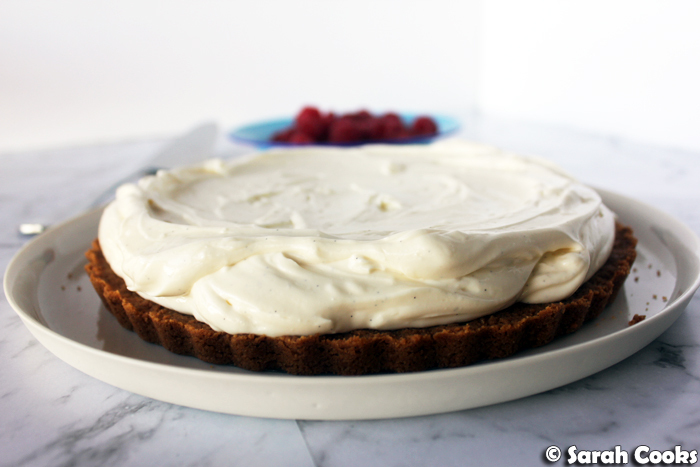 I love the pretty shape you get from a fluted tart tin, but any round tin will do. To make the topping, you simply beat together equal weights of cream cheese and Greek yogurt, with some sugar and vanilla. (I used vanilla bean paste because I love the flecks of vanilla seed throughout the mixture). Come to think of it, a little lemon zest might be a nice addition. Next time. The mixture is thick and creamy with a lovely dollop to it. Once the base is baked and cooled, you can assemble it. It's really just a matter of spreading the mixture haphazardly over the base. You don't need to make it too even; in fact the undulating waves of cream cheese are what make the cheesecake look so pretty. (And it's the cake's cloud-like appearance that led to me calling it a "heavenly" cheesecake). 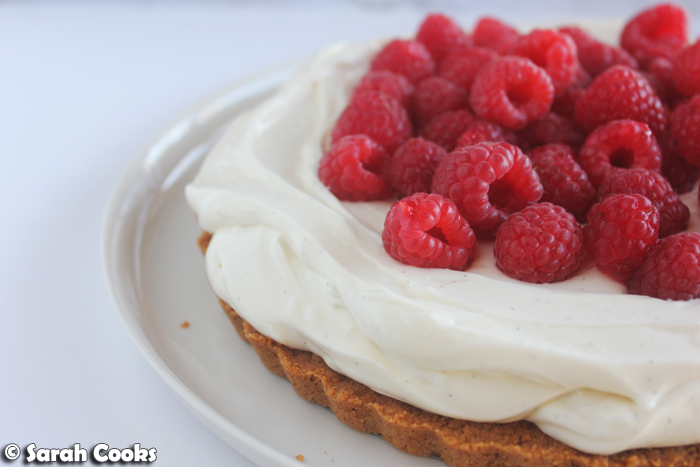 Raspberries are one of my favourite fruits, and this cheesecake is a wonderful way to use them - even now, in April, there seem to be lots of gorgeous late-season raspberries in the shops. I'm thinking other berries would be lovely too. I've used strawberries before, with great success. Or in winter, some jarred fruit - apricots or sour cherries would be divine. One thing to note is that the cheesecake mixture is not overly sweet; if your fruit is quite sour, you might want to add some more sugar to the mixture. (Or dust with icing sugar before serving). And that's it! It went down a treat. Surprisingly, we had some leftovers, and they held up very well over the next few days in the fridge - the base remained crisp and the topping kept its shape. Quick and easy to make, looks beautiful and impressive, incredibly delicious. Enjoy! 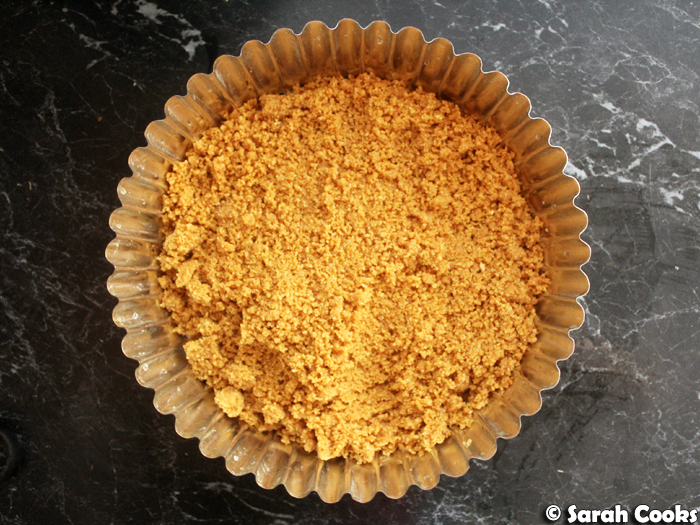 To make the base, mix together the graham cracker crumbs, butter and cinnamon. Press into the base of a 22cm tart tin. Bake for 10 minutes, then place the tin on a rack to cool completely. 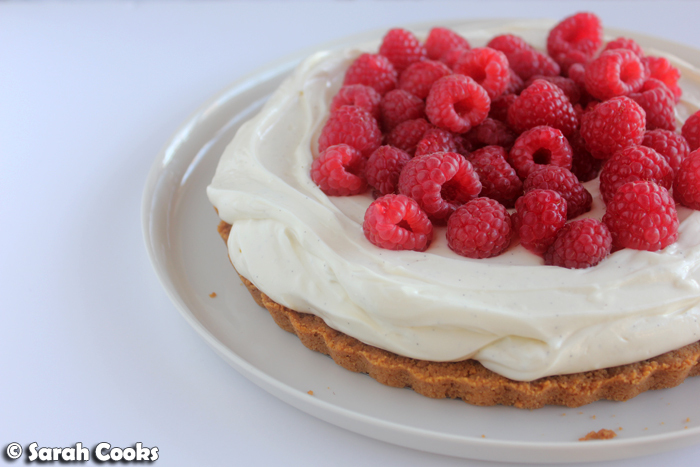 To make the topping, beat the cream cheese in an electric mixer until softened and smooth. Add the caster sugar and vanilla bean paste and beat to combine. Switch to a wooden spoon and fold in the Greek yogurt. 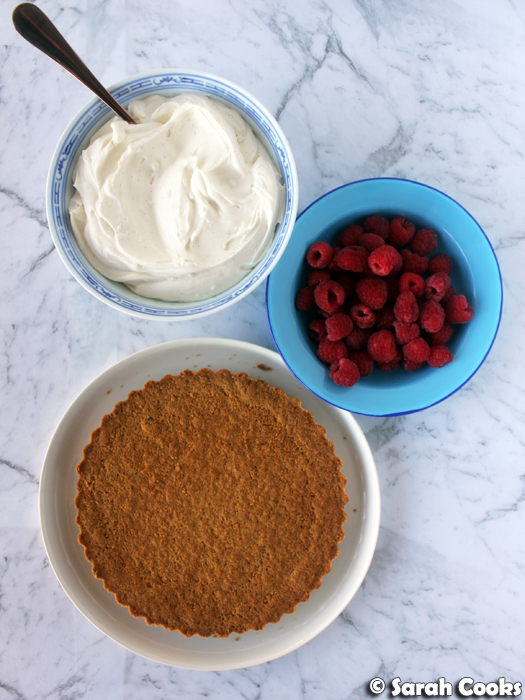 To assemble, transfer the biscuit base from the tart tin to a serving plate. Spoon over the cream cheese mixture and spread it with a palette knife or large metal spoon in a wavy fashion. Scatter with the raspberries.